File Sharing is not itself illegal, especially if used to share files that you actually created and own or collaborated on. Like any medicine, if you abuse the usage, it becomes illegal. Read this article to know the pros and cons of file sharing. When is file sharing not illegal? The ability to download files through the Internet has become quite a phenomenon. The tools used in downloading and sharing are no longer removable media and e-mail attachments, but are more likely to be advanced and comprehensive applications such as download managers, P2P clients, and of course, by hosting the file and sharing the link for others to download. When it is illegal to share a file? It is always illegal to share a file if the object you are sharing includes an instruction that you cannot share or distribute it. Copyrighted files or materials can be shared as long as the license says you can share them or distribute them. An example is music files you have purchased online. Most recording company have agreements with distributors of songs and videos which allows you to transfer and play the music in your computer and in another player e.g.MP3 player, iPod, or Zune. You have the option in sharing or synchronizing your media files from another device to media player software for devices you already own and for non-commercial use in most cases. Copyrighted software with GPL, L-GPL, etc. common in open source software can be shared with others subject to some restrictions such as including the complete source code for the project or program when you distribute it or share it. What are the pros and cons of file sharing? Again, file sharing is not itself illegal, as long as you share what is yours and what is not copyrighted by other people or by a company. Part of the answer that It depends on what you share. If, for an example, you like to share your photo album to your friends, it is legal. If you have a project to share that will allow your classmates, colleagues, or people with the same interest in working on your project, it is not illegal to share your work or source code. Most files that can be legally shared have licenses that detail what can be done and cannot be done. The pros of file sharing is the ability to collaborate using collaboration tools such as e-mail, blogs, or any applications which allow a direct download from the person or computers hosting the files. ➥ Software developers who want to share their files to testers- it allows them to get free feedback and receive bug or error reports. ➥ Recording company and its registered distributors who allow the use of file sharing are giving their customers a preview of the songs they want to hear before buying. It benefits also the buyers of music because they don't have to purchase the whole CD or album. There is now an option to choose only the songs that you like to purchase. 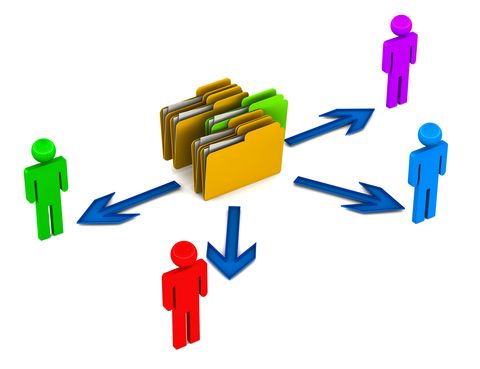 ➥ People at work and school also benefits in sharing files. It allows their colleagues and classmates to work on their project at work or at school. An example is the people who are involved in Open Source projects. ➥ Individuals also benefits in sharing their files via home networks or by sharing their personal files to their family or friends. What about the cons of file sharing? When you download files from people that you don't know or from the untrusted source, there is a risk of downloading viruses, Trojans and other types of malware. Some end-users are confident in illegally downloading files if an antivirus program has support to scan the connections and the files, using a P2P application. They don’t realize that their private information is at risk, in addition to facing the law if their ISP has determined that their customer is using the internet connection illegally. If you will share your files by allowing the P2P applications to open your computer or a folder to other users in the P2P network, you are at risk to sharing your personal and sensitive information. If you are using a computer at work to share or download files to untrusted source or people, you are putting the whole computers at work at risk. You might be leaking sensitive and private information that your boss will never share with his permission. File Sharing is a great method to collaborate. P2P applications is a great resource to download files but it is important to be aware of the risks, proper usage of any file sharing tools and of course, be aware of the pros and cons of file sharing, before participating.